The Blaster: Why Are Defense Policy Wonks So Ineffectual? Today, America’s foreign policy is a shambles. Its primary features are (1) a perpetual war on terror, and (2) the seemingly inevitable march into a new and unnecessary cold war against Russia and China. At the same time, President Obama is leaving his successor with a budget plan containing a front loaded and political engineered* procurement bow wave that guarantees steeply rising defense expenditures well into the next decade and possibly beyond. Such long term increases in the defense budget can only be justified by a new cold war. 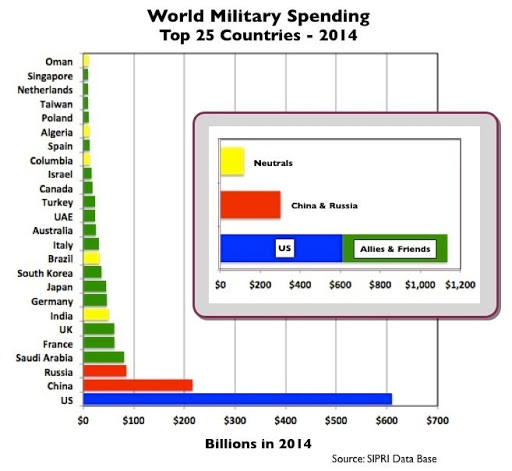 Yet the United States now spends far more on the military than any other country. Add in the expenditures of our allies, and the spending advantage over any conceivable combination of adversaries becomes overwhelming. Nevertheless, US citizens are more fearful than they were during the Cold War, and politicians and the yellow journalism of the mainstream media are hyping those fears to a greater extent than they did during the Cold War. Most pundits and policy makers who debate this dismal state of affairs subscribe to the view that fixing foreign policy is the first step toward getting control of the Pentagon and ultimately reducing defense budgets. In their view, the top priority should be to re-define our foreign policy goals (hopefully in accordance with the criteria for a sensible grand strategy, although these criteria are seldom examined in a systematic way). The redefined grand strategic goals would then form a basis for defining a rational military strategy to meet these goals. Once the strategy is settled upon by the policy elites, the drones in the Pentagon can define the force structure to meet the strategy. That force structure would then provide the template against which the budgeteers can define the budget decisions needed to build and maintain the forces necessary to execute the strategy. QED. This neat comforting top-down viewpoint conveys the illusion of control. It plays well in the high brow salons of Versailles on the Potomac, the halls of Congress, and among the elitist pundocracy in the mainstream media and the ivory tower think tanks of Washington. But history shows this logic does not work. The logic has been repeated ad nauseam by policy wonks on the left and right since the dawn of the Cold War in 1950. Yet for all their handwringing about strategy-budget mismatches, the policy wonks refuse to recognize the obvious: Since 1962, the Pentagon’s formal planning system — the Planning, Programming, and Budgeting System (PPBS) — is a set of bureaucratic procedures designed precisely in accordance with their sacred top-down logic. Yet the PPBS has failed repeatedly to link budgets to forces and strategy (for reasons I explained here and here). The simple-minded idea that foreign policy (i.e., grand strategy) drives strategy and shapes force structures and budgets simply does not work in the real world. And the reason is fundamental: the Military - Industrial - Congressional Complex (MICC) is not a top-down mechanistic phenomenon that responds predictably to this kind of naive control theory. The MICC is more accurately thought of as a synthetic (bottom-up) living culture that creates its own political-economic ecology. Part of that ecology is the MICC’s corrupting effects on domestic politics. President Eisenhower’s prophetic warning about the rise of misplaced power hinted at but did not delve into the reasons for the living nature of this political-economic ecology. It is now fifty-four years later, and the MICC has evolved into a deeply entrenched, bewildering variety of ever changing goal-seeking factions, each fighting for money and power in a game of very messy domestic politics. 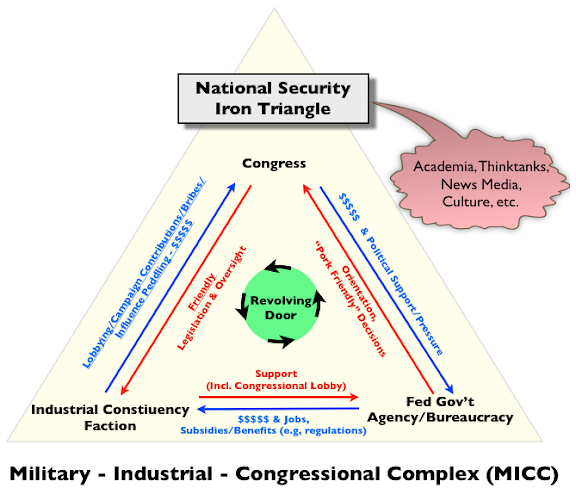 These factions are loosely self-organized (via revolving doors, for example) into iron triangles that grow and decay over time. These factions compete with each other or make temporary alliances of convenience in their efforts to acquire money and power (as I explained here, here, and here). Put another way, the MICC is fundamentally a bottom-up living, evolving political-economic organism, and it produces its own peculiar ecology. It is made up of self-organizing factions in which the pursuit of each faction’s individual goals create combined effects that can be thought of as the MICC’s emergent properties. There is simply no way the sterile top-down logic described above can cope with the MICC’s ever-evolving power games and unpredictable work arounds. The output of the game is summed up pithily by Boyd’s quote, and the MICCs players are now hell bent on starting a new Cold War as the only way to achieve its factional ambitions. We will not fix this problem posed by the MICC until we come to grips with its elemental nature. Attached is a recent essay by my good friend Andrew Cockburn. Andrew brilliantly elaborates on Boyd’s point and the apparent disconnect between strategy and budgets. I say “apparent disconnect” because the MICC has a real strategy, and like all effective strategies, it is not obvious. * Front loading and political engineering are explained in my 1990 pamphlet Defense Power Games. Posted by Andrew Cockburn, TomDispatch, at 7:28am, June 16, 2016. Given this focus, creating and maintaining an effective fighting force becomes a secondary consideration, reflecting a relative disinterest -- remarkable to outsiders -- in the actual business of war, as opposed to the business of raking in dollars for the Pentagon and its industrial and political partners. A key element of the strategy involves seeding the military budget with “development” projects that require little initial outlay but which, down the line, grow irreversibly into massive, immensely profitable production contracts for our weapons-making cartels. In other words, in the Cold War as today, the idea of “nuclear war-fighting” could not survive scrutiny in a real-world context. Despite this self-evident truth, the U.S. military has long been the pioneer in devising rationales for fighting such a war via ever more “modernized” weapons systems. Thus, when first introduced in the early 1960s, the Navy’s invulnerable Polaris-submarine-launched intercontinental missiles -- entirely sufficient in themselves as a deterrent force against any potential nuclear enemy -- were seen within the military as an attack on Air Force operations and budgets. The Air Force responded by conceiving and successfully selling the need for a full-scale, land-based missile force as well, one that could more precisely target enemy missiles in what was termed a “counterforce” strategy. The drive to develop and build such systems on the irrational pretense that nuclear war fighting is a practical proposition persists today. One component of the current “modernization” plan is the proposed development of a new “dial-a-yield” version of the venerable B-61 nuclear bomb. Supposedly capable of delivering explosions of varying strength according to demand, this device will, at least theoretically, be guidable to its target with high degrees of accuracy and will also be able to burrow deep into the earth to destroy buried bunkers. The estimated bill -- $11 billion -- is a welcome boost for the fortunes of the Sandia and Los Alamos weapons laboratories that are developing it. The ultimate cost of this new nuclear arsenal in its entirety is essentially un-knowable. The only official estimate we have so far came from the Congressional Budget Office, which last year projected a total of $350 billion. That figure, however, takes the “modernization” program only to 2024 -- before, that is, most of the new systems move from development to actual production and the real bills for all of this start thudding onto taxpayers’ doormats. This year, for instance, the Navy is spending a billion and a half dollars in research and development funds on its new missile submarine, known only as the SSBN(X). Between 2025 and 2035, however, annual costs for that program are projected to run at $10 billion a year. Similar escalations are in store for the other items on the military’s impressive nuclear shopping list. Accordingly, the high command cut back on spending for “readiness”; that is, for maintaining existing weapons in working order, training troops, and similar mundane activities. This had the desired effect -- at least from the point of view of Pentagon -- of generating a raft of media and congressional horror stories about the shocking lack of preparedness of our fighting forces and the urgent need to boost its budget. In this way, the hapless Jimmy Carter, elected to the presidency on a promise to rein in defense spending, found himself, in Spinney’s phrase, "mousetrapped," and eventually unable to resist calls for bigger military budgets. Andrew Cockburn is the Washington editor of Harper’s Magazine. An Irishman, he has covered national security topics in this country for many years. In addition to numerous books, he co-produced the 1997 feature film The Peacemaker and the 2009 documentary on the financial crisis, American Casino. His latest book is Kill Chain: The Rise of the High-Tech Assassins (just out in paperback).